Video presentation for TC-Helicon’s online ‘Voice Council’ magazine (Oct, 2011) on including patterns like the blues scale in vocal practice. Video presentation for TC-Helicon’s online ‘Voice Council’ magazine (July, 2011) on the importance of the minor pentatonic scale in black-influenced pop music. Video presentation for TC-Helicon’s online ‘Voice Council’ magazine (March, 2011) on the importance of getting the key of a song right. Video presentation for TC-Helicon’s online ‘Voice Council’ magazine (August, 2010) on vocal warm-ups beyond the major scale. Video presentation for TC-Helicon’s online ‘Voice Council’ magazine (May 2010) on vocal warm-ups using the Dorian mode. Video presentation for TC-Helicon’s online ‘Voice Council’ magazine (April 2010) on vocal warm-ups in readiness for performance. Article for TC-Helicon’s ‘Voice Council’ online magazine (June 2011) regarding my top 3 priorities as a vocal coach. Article for TC-Helicon’s ‘Voice Council’ online magazine (June 2011) regarding the necessity for training the ear and the voice equally for singers. Article for TC-Helicon’s ‘Voice Council’ online magazine (June 2011) regarding advice on effective articulation for singers. Article for TC-Helicon’s ‘Voice Council’ online magazine (June 2011) regarding advice on breathing and support for singing. Article for TC-Helicon’s ‘Voice Council’ online magazine (May 2011) regarding advice on postural considerations for singing. Article for TC-Helicon’s ‘Voice Council’ online magazine (May 2011) regarding advice on vocal warm-ups and cool-downs. Article for TC-Helicon’s ‘Voice Council’ online magazine (May 2011) regarding advice on vocal rest. Article for TC-Helicon’s ‘Voice Council’ online magazine (May 2011) regarding physical and vocal fitness for vocalists. Article for a singer’s website regarding how to practice effectively. Article for ‘X Magazine’ magazine (Issue 8, Nov 2010) regarding life as a vocal coach. Article for TC-Helicon’s ‘Voice Council’ online magazine (Aug 2010) regarding recording vocals. Article for the ‘Voice of ANATS’ online magazine (Volume 23, no.2, June 2010) regarding the pesky passaggio! "The Passaggio – Technical and Interpretative Issues"
Article for ‘The Stage’ magazine (Sept 2009) regarding vocal care for gigging singers. "I’m touring and working as a singer – I can’t afford to turn down work, but how can I take care of my voice while I’m doing it?" Article for ‘Classic Rock’ magazine (May 2009, Issue 131) regarding what it takes to be a top rock singer. "What you need to be a top rock singer"
Article for the ‘Music Teacher’ magazine regarding vocal health issues for gigging singers. "Pop Repertoire and Vocal Health"
Article for the TC-Helicon ‘Voice Council’ regarding which vocal exercises I considered to be my ‘bottom line’ favourite ones. Article for the TC-Helicon ‘Voice Council’ regarding what I take to three different types of gig. "What’s in my gig bag"
Article for “The Singer” magazine on what it takes to be a backing vocalist. "Backing Up"
Abstract for Master’s Dissertation – London College of Music. You can contact Kim to request a copy of the complete document. "A Methodology for Singers of Popular Music"
Kim exclusive interview in "The Vocalist Magazine"
Kim interviewed on BBC Radio 2 for the "Simon Mayo Show"
Kim MDs 93-voice choir for charity single at Abbey Road Studios for "Save The Children"
Kim has chapter in new book "Teaching Singing in the 21st Century"
Kim features in popular industry book "The Ultimate Guide to Singing"
Get your voice in shape TODAY! 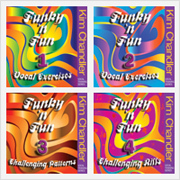 Check out Kim''s revolutionary Vocal Training Series!